Thank you to the UPark community for all your support. Our next community meeting is taking place at 6 p.m. on Thursday, Feb. 1 in our auditorium. I, along with members of my team, DPS officials and law enforcement officers will be on hand to respond to your questions. 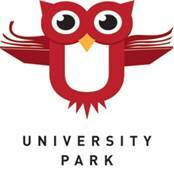 *Don't forget to download the UPark App HERE! Save the Date for 8th Annual UPark Auction! Come and kick up your boots to support University Park Elementary! Our 8th annual auction will take place on Saturday, April 21, 2018 from 6:30 PM - 10:30 PM in the Gold Club at the University of Denver. Tickets are $45 per person and will go on sale on March 1, 2018. Tickets include: dinner & dessert, live music, a cash bar, games, and a live and silent auction. For more information, please visit our website HERE. Our online auction will begin on Thursday, April 12, 2018. All proceeds will benefit University Park Elementary and our goal is to raise $75,000. If you would like to donate a good or service, sponsor the event, or volunteer, please email Katie Fitz-Gerald and Becky MacDonald at auction@uparkelementary.org. UPark school tours for prospective families have started! We will hold tours on the dates below. Please let your friends know to RSVP by calling the main office at 720-424-3410. We had our second spelling bee the morning of January 25th and the team did an amazing job! All ten of our kiddos were able to compete and they worked HARD....and had a great time in the process! Congratulations to Shreyas R and Adia S, fourth and sixth place winners! Our last team event will be the DPS Written Spelling Contest on February 10th...wish us luck! Instead of cheese, they said "rendezvous" (one of our words...Semantics humor), thus the fish faces...ha! Please read below for protocols on when a bed bug is found on campus. These events are typically isolated and do not indicate a building infestation. The risk of spread is minimal. Please join in support of the UPark Band Program as our students perform with the DU Pep Band on February 8th at 7 p.m. I nvite friends and family to see the Pioneers vs. S. Dakota for a fun night of basketball and music! The band will play "Jump", "We Will Rock You", "Wipe Out" and the "Star Spangled Banner" to start the game! We will receive $5 for every ticket sold, so please put this on your family calendar! Please fill out this ticket order form and bring it with a check or cash (exact change required) to the front office to purchase tickets. Tickets are $12 and will help us raise funds for scholarships and growing our band program. The Big as Life Music (BALM) Summer Band Camps are week-long camps (9 a.m.-3 p.m.). Whether your child plays an instrument or would like to learn how, camp will be sure to inspire them on their musical journey. Beginning, Intermediate and Advanced students are welcome. Camps are taught by Christmas Gainsbrugh, DPS Band Director at UPark! Incoming 4th-8th graders can join us for Summer Band Camp to learn how to play the flute, clarinet, trumpet, french horn, saxophone, trombone, tuba or drums. Go to BigasLifeMusic.com for camp details and to register! Click here for camp flier. Please contact Christmas Gainsbrugh at Christmas.BALM@gmail.com with any questions. REGISTRATION GOES LIVE ONLINE TUESDAY 2/6 AT 10AM!!!! -To view the online course catalog click here. Do you love after school Enrichments!? Take a look at our single subject a la carte Enrichment Camp. Sign up for one to four blocks, featuring your favorite enrichment providers! To access the Online Course Catalog please click here. For Discovery Link Summer Camp information please click here. Last week's students include: Jonathan Jackson, Sheridan Wetherall, Reily Doi-Jared, Jai Benford, Crosby Stutz, Kaiden Enloe, Capri Kristie, Max Henze, Viola Volpi-Swank, Attia Abdelgawad, Amelia Babbitt, Ella Fairchild, Ikram Fakhraoui, Brendan Seitz, Patrick Monahan, Carter Faulkerson, Jackson Rinner, Damien Manzaneras, Josie Strout, Maddi Blair, Karma Montoya, Owen Fairchild, Jack Carmichael, Noah Hayes, Alex Locia-Anota, Franziska Henze, Iris White, Paige Wilson, Lucas Lipke, Carlee Erb, Noble Stewart, Lily Baker, Kenna Whorton, Dempsey Ruehrdanz.